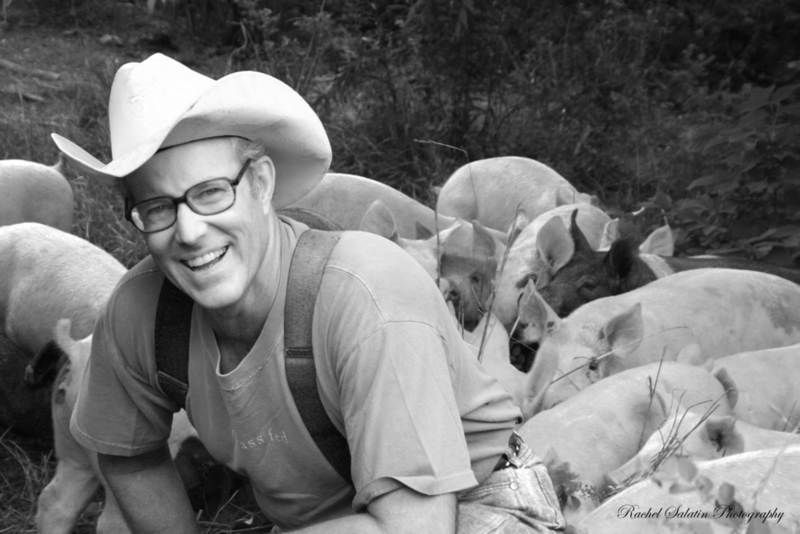 Joel Salatin, 61, calls himself a Christian libertarian environmentalist capitalist lunatic farmer. Others who like him call him the most famous farmer in the world, the high priest of the pasture, and the most eclectic thinker from Virginia since Thomas Jefferson. Those who don’t like him call him a bio-terrorist, Typhoid Mary, charlatan, and starvation advocate. He has authored 12 books. Patrick's Great Grass Adventure With Greg the Grass Farmer, a children's book illustrated by daughter, Rachel Salatin. Joel Salatin was a great addition to our series, “The Ethics of Food and the Environment.” This series brings scholars, policy makers and practitioners to campus to reflect on the ways that what we eat and consume can raise moral questions. After hearing these presentations — from some of the world’s leading climate scientists — members of the audience often wonder what they can do. That’s where Joel’s talk really resonated. With great humor and passion, Joel presented an intriguing alternative to conventional food production, and inspired the audience to connect to local food systems.